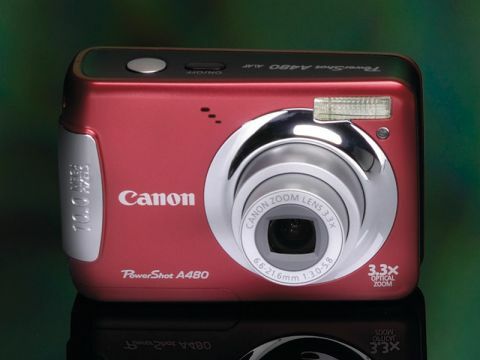 The Canon PowerShot A480 has a meagre set of controls and a relatively lacklustre 2.5-inch LCD. Despite the plasticky feel of the camera, there are a few thrills, including face-detection auto-focus which is linked with metering and flash exposure as well as white balance. You also get motion detection technology, which senses subject motion and increases the ISO setting for faster shutter speeds. Sadly though, this is the only model on test to lack Canon's optical image-stabiliser system built into the lens. The only shooting modes on offer are full Auto, Program and various scene modes, but at least there's manual white balance, various colour rendition options and the choice of evaluative, centre-weighted and spot metering. Another neat trick is auto red-eye correction, which is available in both shooting and playback modes. For what is essentially a basic point-and-shoot camera, the A480 delivers very pleasing image quality.